When I read online that Chef Paul Bartolotta flies in two tons of fish directly from the Mediterranean to The Wynn at least every 36 hours, I booked a reservation without even blinking. Our server, Maurizio, whose thick accent I could hardly understand yet whose laugh was contagious, tended to our table for a two-hour dining experience with my mother and grandmother that I will never forget. I drooled over the separate truffle menu (which, might I add, adds $90 per dish for the Italian-imported white truffles) and regretted my black jack habit earlier in the day. Next time, I’ll splurge on the truffles instead of the chips! The restaurant’s menu is indelible, to say the least. The homemade pasta and seafood selection is extraordinary, and whole fish offerings are chipped away from a salt casing right at your table. The three of us absolutely over-ordered. Surprise, surprise. Appetizer portions are listed with the option to double the serving for an entrée…but do not be mistaken. The appetizer portion is plenty along with another appetizer or two for the table. Luckily, my grandmother, mother and I all have the same taste buds. So all was shared. 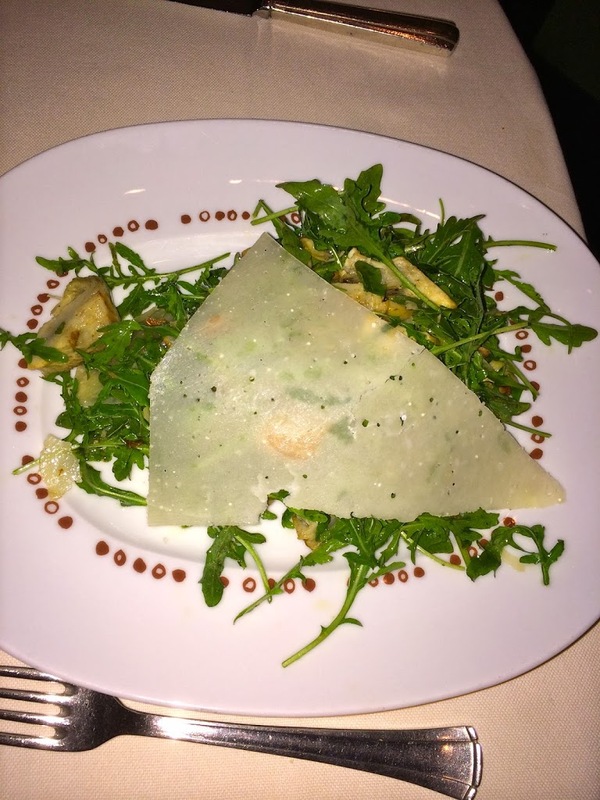 We began with two wilted arugula, artichoke, porcini and Sardinian pecorino salads with the perfect vinaigrette to share between the three of us. My favorite appetizer was the poached shrimp with cannellini beans, basil and pomini tomatoes. I am dying to try this in my own kitchen. The recipe is light and healthy, but the beans add a subtle richness. Oh, but there’s more. At the same time, sautéed tiny clams in a tomato broth were served. We used ciabatta slices to soak up the sauce. The last appetizer was a seared scallop atop imported porcini mushrooms. The thinnest slice of parmigiano-reggiano lay across the top of each of the two scallops. That scallop tasted like butter. For the main courses, I ordered a hand made ribbon pasta with imported porcinis. My mother ordered pasta “rags” with lobster, crab, shrimp, white wine and tomato. We happily switched after trying each others! My grandmother’s seafood risotto was beautiful. In the middle of the table sat a ricotta-filled ravioli with pecorino and Marsala wine glaze. Holy moly, it was divine…but it was so rich that I could not eat more than a bite. If you’re into cheese, you’ll be in heaven. Note: We ordered appetizer portions and could not even finish them. A small scoop of coconut sorbet topped us off before the check. Seafood lovers, pasta lovers, Vegas lovers, any lovers…go to Bartolotta on your next trip to Las Vegas. You will be very, very pleased.